Sara (1992) is Dariush Mehrjui’s film based on Henrik Ibsen’s famous play, A Doll’s House (1879), but transferred into a contemporary Iranian setting. There were two striking aspects to this film when I saw it. The first is just how closely Mehrjui follows Ibsen’s story. Usually when theatrical plays are transferred to film, there are considerable alterations made in order to accommodate the presumed requirements of the cinematic medium. But here, and despite the transfer to Iranian surroundings, Mehrjui’s story is almost a literal transcription of Ibsen’s work. (Although a peripheral character from Ibsen’s original play, Dr. Rank, has been removed from Mehrjui’s treatment, this role is incidental to the events of the story, and the removal is, if anything, a slight improvement on the original.) The second thing that immediately struck me about the film was just how well a virtually unaltered transcription of Ibsen’s story sits in and applies to its modern Iranian context. Ibsen’s play relies more on verbosity than action, but it is nevertheless regarded as a landmark in helping to change European cultural attitudes concerning both women’s rights and the role of women in the family. Mehrjui’s Sara transfers those concerns to the Iranian setting. The story concerns a young married couple’s legal crisis and its ensuing implications. Ibsen’s play, but not Merhuui’s film, is structured in three acts, and I will partition the following narrative description accordingly. Sara is a beautiful, attentive, and practical young wife whose husband, Hessam, has a life-threatening illness and needs immediate, costly overseas treatment to survive. Sara manages to find the money for this treatment, and the action shifts forward three years, with the happily married couple celebrating Hessam’s promotion to vice president of his bank. Sara then meets an old school friend, Sima, who is now a young widow and looking for a job at Hessam’s bank. Sara confides to Sima that she secretly borrowed the money to pay for Hessam’s life-saving treatment and has been working slavishly ever since as a seamstress to pay off the loan. We soon learn that Sara borrowed the money from a shifty bank employee, Goshtab, who just happens to have been a past suitor of Sima. For a woman to have arranged a loan behind her husband’s bank, particularly a husband as financially fastidious as Hessam, it would be a scandal if it were revealed in any society, not to mention Iran. So it’s important that this be kept a secret. Anyway, when Sara goes to Goshtab to make her final loan repayment, Goshtab refuses to accept it and return her IOUs. He has his own problem – he’s worried about losing his job, and he threatens to reveal her loan to Hessam unless she uses her influence to preserve his job status. He further points out that Sara had forged her father’s signature to endorse the loan and that this is a criminal act that he could also reveal. So the stage is set: Sara has a big problem and the future of her marriage is at stake. Sara is clearly frightened by Goshtab’s possible exposures and urges Hessam to save Goshtab’s job, but to no avail. So after Goshtab is fired, he informs Sara that he has written a blackmailing letter to Hessam implicating not only his wife, but also Hessam, as bank manager, in a criminal activity. The letter demands that Goshtab be not only rehired, but promoted, to boot. Now even more distressed than ever, Sara confesses everything to Sima and seeks her help. Sima says she knows how to manipulate her old boyfriend and will try to turn him around. He goes on to accuse her of adultery and telling her she is unfit to raise their child. Sara is shattered by these accusations, but continues to cook and keep house like a good wife. When Hessam protests that no man would sacrifice his honor just for the sake of love, Sara responds, “and yet women do it all the time.” With that she takes her daughter and departs in a taxi to a new and unknown future. As mentioned above, this story isn’t just another take on a conventional perspective on women’s rights (that is, the freedom to participate in public activities, which of course can be an issue in traditional socially conservative societies), but is instead more focused on a woman’s role inside a marriage relationship. Is she really being treated as a partner? And that question is as relevant today as it was in Ibsen's time. The acting performances in Sara are all excellent, especially Niki Karimi, as Sara, and Khosrow Shakibai, as Goshtab. In such a talky film with almost exclusive dramatic focalization on the title role, Niki Karimi’s sensitive and energetic performance manages to sustain the viewer’s interest all the way along. 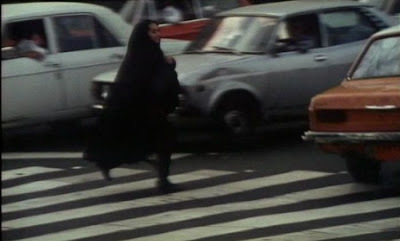 And for his part Khosra Shakibai, who had earlier starred in Mehrjui’s Hamoun (1990), has just the right anxious countenance and body language to portray the Goshtab character. 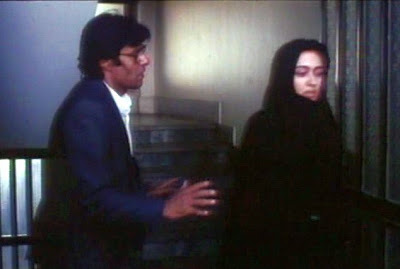 The narrative pace of the film is further supported by Mehrjui’s cinematography and editing. To break up the potential monotony of extended dialogues, Merhjui employs numerous point-of-view closeups and situates a number of these scenes on the street or in domestic courtyards. He also intersperses among those sequences various tracking shots of Sara running about in the city streets and domestic scenes of Sara preparing dinners and looking after her home. There are a couple of technical oddities, though. On a number of occasions, a scene closes with a fade-out to red, rather than black. This didn’t work for me here, but you may have a different reaction. In addition, Merhjui has a number of on-axis camera dissolves within a scene. This effect avoids the jar of a jump-cut, but it is still noticeable, and perhaps Merhjui felt this was necessary to connect his best takes. In any case, whether you are interested in Ibsen’s play or contemporary Iranian society, this film treatment is a success and worth seeing.